Liquid Asset Fishing is a charter fishing service in the scenic Golden Isles of Southeast Georgia. We offer half day and full day offshore fishing packages for the sporting enthusiasts in your family. Our vessel is the beautiful Liquid Asset, a 27' Contender boat powered by twin 200 horsepower Yamaha engines. This fishing machine makes for a smooth ride and an enjoyable trip! 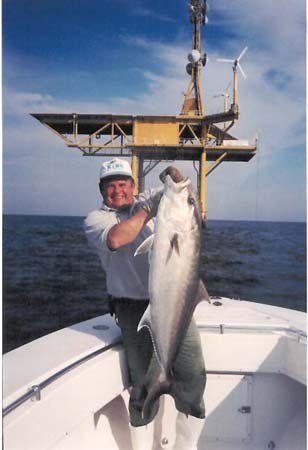 Larry Swicegood is a United States Coast Guard-approved master captain with twenty years of saltwater fishing experience in the teeming waters off of St. Simons Island, Jekyll Island, Sapelo Island, Blackbeard Island, and Sea Island. Our photo gallery shows some of the species you may catch in our local waters. Please contact us for details about the locations we fish, the species of fish you can catch, and pricing for these great fishing adventures! We will be happy to answer any questions you have! Not into fishing? We also do charter tours! See our local sights and wildlife, not limited to the Saint Simons Island Lighthouse, the Sidney Lanier Bridge, the Port of Brunswick, Sapelo Island, St. Catherine's or Cumberland Island. Sunset cruises and sight-seeing tours are available. Our links page has more information about what our beautiful Golden Isles have to offer. NEW! See our recipes section to learn how we prepare the delicious fish we catch!